Hello all! I have really been thinking about adopting a yearling mustang filly for over a year now and I am ready to take the plunge here in a couple months. I just lost my 26 year old Arabian and she was absolutely amazing, when I got her she was sitting for about 8 years and I dont have "formal" training so everything that we did we had to figure out together. I definitely wouldn't call her a beginner's horse but she was mine. By the end of it I swear we could read each others minds and she looked to me for guidance, I also listened to her when she sensed things that I couldn't. But I digress, there is a group of wild horses about 2 hours from where I live (oak creek wild horses if anyone wants to look them up) and I am planning on contacting the lady that manages the herd soon to set up a meeting. The thing that draws me to this herd is that they aren't afraid of people. Anyone is allowed to go visit the herd with a donation of alfalfa, the entire herd will come running down off the hill to eat and alot of the new foals have seen people since birth so they are very willing and curious, some will even come up for scratches. They are believed to be descendants of Morgans which is another reason I am drawn to them. The way I seen it if I spend the next few years really working with this filly I will have a great partner for the next 20+ years. I am in no rush for anything, since losing my mare I just need an equine companion to keep me sane. I ride for a lady across town so at least once I get her leading and able to be hauled I can pony her. I guess I dont have any real question, I'm just excited and looking for other people's experience with untouched yearlings. I have been reading other experiences and pulling out what I feel can benefit me so I would love to hear whatever anyone would like to share! RegalCharm, akihba, knightrider and 4 others like this. If you get one directly from the BLM, they will pay you for taking it. RegalCharm, Knave, AtokaGhosthorse and 2 others like this. The Oak Creek Wild Horses are nice horses and you would have a great partner in one when you get one. One thing that they have over the BLM mustangs is that they are kind of pre-gentled to people. The lady who manages the herd will definitely help you pick one out to match you. Scratch was the 1st horse John ever trained on his own (he had help, but did all the work himself). Looking forward to hearing all about your filly when you get her AND lots of Pix!! RegalCharm, Rawhide, knightrider and 3 others like this. Thank you I saw that they were doing this, I really hope it helps to place alot into really good homes. I however am more interested in the oak creek herd for my next horse. Everything that I have seen involving them just makes me more excited to meet them. I do have a friend that adopted one last year and her filly is a doll, I had never heard of them before that somehow! Thank you so much, I'm really glad you posted those videos! I love how even when Scratch gets upset over an obstacle he settles back down so quickly, they seem like they really have great minds. I also like how there are several trainers in the area who have done alot of work with these guys; that way if I have trouble or if I would like some finishing work done in a few years I have some good people to choose from. Plus getting to see the horses relaxed in their natural habitat is going to be so helpful in choosing the personality that will fit well with mine. I have an appointment next week to meet with the oral surgeon to set up getting my wisdom teeth removed &#x1f62b; but after I am all healed from that I plan on getting in contact with her so I can go up and meet the herd. I will definitely post lots of photos and keep everyone updated! RegalCharm, Rawhide, boots and 6 others like this. Experiences with untouched yearlings & brumbies... I have had lots to do with unhandled horses, but little(but some) to do with truly untouched horses who were afraid of people. In that little experience, and knowing of other's experiences with brumbies or station horses straight off the truck, it doesn't take long to teach them to come to you, if you know what you're doing, then the rest just comes out of that, as with other unhandled horses. So I wouldn't get too excited about these horses being 'pre-gentled'. Experience with untouched yearlings... from a hoofcare perspective. 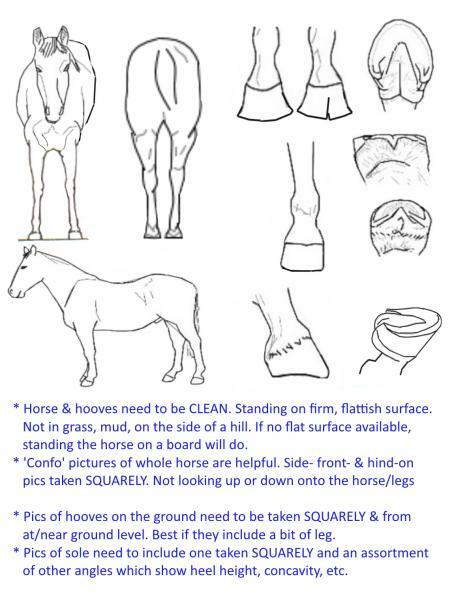 It depends how they live, how many miles daily they do on abrasive terrain for eg, but horses who have grown up in 'normal' domestic paddocks, or otherwise rather sedentary, often have significant hoof imbalance by the time they're yearlings, if their feet aren't attended. So keep that in mind too. I don't know what the deal is with the multitude of poor horses trapped in pens by your BLM, but if possible, if getting from there, I'd want one that was recently trapped. RegalCharm, Cordillera Cowboy, knightrider and 2 others like this. Those Oak Creek horses are truly handsome. A cut above most BLM mustangs in classy conformation. They apparently go back to Morgan ancestry. I would go for it. You would be wise to hook up with an experienced mentor though. Easy to go wrong starting a horse. loosie, RegalCharm, Cordillera Cowboy and 5 others like this. I love how even when Scratch gets upset over an obstacle he settles back down so quickly, they seem like they really have great minds. Scratch was not typical from what John said; he would get upset and many times take off from him, which is not what most of the people experienced with their horses. But Scratch was one of the older horses (8 or 9 I think) when he was caught for this competition. John was the last one to choose and Scratch was the last horse, so he didn't get a choice. But I think they are a good fit and John's done a good job with him. I also like how there are several trainers in the area who have done alot of work with these guys; that way if I have trouble or if I would like some finishing work done in a few years I have some good people to choose from. Plus getting to see the horses relaxed in their natural habitat is going to be so helpful in choosing the personality that will fit well with mine. Yes, there are lots of trainers that can help you if you need it! Until you get your pony, I know Amber McGee in Tehachapi holds regular gentling clinics at her place - you don't have to have a horse to participate or you can just audit. Might be an option to go & audit one (or two) while you are healing up! So excited for you! Can't wait to see your updates ... btw, you can start a journal/blog of your adventures in the Membership Journal section below ... that would be an awesome place to keep track of your journey. RegalCharm, knightrider and Knave like this. The Oak Creek horses are amazing. RegalCharm, kewpalace, knightrider and 1 others like this. I wouldn't get too excited about these horses being 'pre-gentled'. I am definitely not expecting her to be easy, I only mentioned because I like the idea that they don't have fear associated with people as nothing is as traumatic as say the blm round up. People bring food and visit them so they are at least used to seeing people and when they are caught the catch pen is opened with food thrown in and gate closed behind them. It may take longer to catch specific horses but it is alot easier on them. Very good point I will keep this in mind. I'm not sure how many miles these particular horses travel a day but I know they live in the mountains and canyons of Tehachapi. If their dirt is anything like mine (lower evaluation about 2 hours away) it is very hard and rocky. I will have to check it out when I am about to go see them. I don't know what the deal is with the multitude of poor horses trapped in pens by your BLM, but if possible, if getting from there, I'd want one that was recently trapped. Another good aspect of getting one where I plan to is that I get to pick her out ahead of time and wait for her to be caught once they travel down to the lower canyon in the summer where the catch pen is. It could potentially take longer if she doesnt want to go in but I'll be notified the day she is caught so she will only be in a holding pen for a max of a couple days. Oh for sure! There is a Facebook group for all the owners of these horses as well as alot of the trainers who routinely work with them so I will thankfully have alot of people I will be able to reach out to. Oh very interesting, he definitely did do a good job with him. I really like how there seems to be such a tight community around these horses so you really get to see the way the majority of the herd behaves. They are of course all individuals but they seem to be very willing and smart. That is a great idea! I will look her up and see if she is having another one soon. I believe they don't start catching them until closer to June so that is a very good option for me. Again thank you for the great advice! I didn't know about that feature, I will definitely take advantage of it. RegalCharm, knightrider, Knave and 1 others like this. Go to first new post Help Name My 2 Year Old! 3 Attachment(s) Go to first new post Western saddle ID help?